An East Antarctic glacier as seen during a NASA Operation IceBridge flight. When scientists talk about Antarctic melting, they’re usually referring to West Antarctica, where giant coastal glaciers are shedding incredible amounts of water. But across the Transantarctic mountains to the east, there’s a much larger mantle of ice that’s generally thought to be keeping its chill. A new study, however, asserts that East Antarctica is also losing weight at a worrying clip. Research published today in the Proceedings of the National Academies of Sciences points to a steady decline in the amount of ice covering East Antarctica since satellite record-keeping began in 1979. While the study finds mass loss from East Antarctica is still lagging behind its neighbor to the West—the former has recently lost some 50 billion tons of ice per year to the latter’s 160 billion—East Antarctica is still a “major contributor” to Antarctica’s slim-down. All told, the study estimates East Antarctica has added 4.4 millimeters to Earth’s global sea level since 1979, compared with 6.9 millimeters from the West. Worryingly, East Antarctica holds 52 of the 57 potential meters of sea level rise locked away in Antarctic ice. Close observers of what’s happening to the frozen continent will know that these are somewhat radical glaciological conclusions. In fact, a major analysis published last June—which most of the new study’s authors participated in—concluded that on the whole, East Antarctica hasn’t been losing ice at all. While that paper determined Antarctica has lost about 3 trillion tons of ice since the early 1990s, it didn’t resolve much of a trend for East Antarctica, which the authors concluded might even be gaining mass due to increased snowfall. While the Nature paper synthesized a number of different techniques and datasets from satellite-derived gravity measurements to altimetry, the new study zeroed in on a single method: the so-called component method. Essentially, the researchers subtracted data on how much ice flows into the ocean each year from data on how much snow falls on the continent. 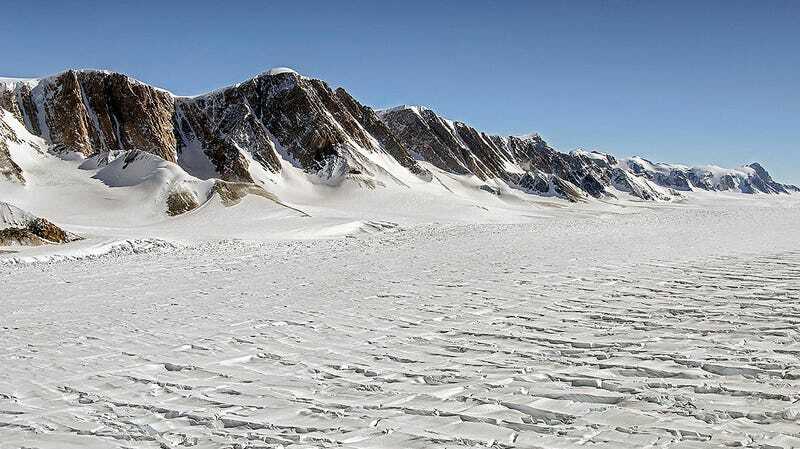 By extending this method further back in time and integrating all the latest datasets, the authors were able to tease out a downward trend for East Antarctica, particularly within the Wilkes Land sector, which they found has been losing mass for 40 years. Otherwise, the numbers agree quite well between the new study and the 2018 paper, University of Leeds cryosphere scientist Andrew Shepherd, who led the recent analysis in Nature, told Earther. Alison Banwell, a glaciologist at the Cooperative Institute for Research in Environmental Sciences at the University of Colorado Boulder who wasn’t involved with the new paper, said she found it particularly worrying that most areas losing mass are “closest to where warm, salty, subsurface, circumpolar deep water (CDW) is prevalent.” She said if the polar westerly winds continue to become enhanced—as is predicted due to climate warming—more of this deep, warm water could be pushed toward coastlines, further driving melting from the bottom of ice shelves. It’s far from the end of the story for this very big, very remote, and very poorly studied part of the world. New datasets expected to come online from satellite missions like GRACE-Follow On, which uses gravity data to track Antarctica’s weight loss, and ICESat-2, which measures the height of icy surfaces, should help researchers refine the picture even further. But this isn’t the first time a study has punched a hole in East Antarctica’s icy fortitude. A study published last summer found that two critical East Antarctic outlet glaciers, Totten and Moscow University glacier, are shedding some 18 billion tons of ice a year. More recently, NASA researchers estimated that four glaciers west of Totten have lost nine feet of surface height since 2008. This article has been updated to include comments from Alison Banwell. It has also been corrected to note that Antarctica contains 57 potential meters of sea level rise, not feet as previously stated.